Carl Chapple is an artist based in South Wales, particularly renowned for his portraiture work with subjects including actors, dancers, poets and musicians as well as comedians. He can often be found at events such as the Edinburgh Fringe and Machynlleth Comedy Festival, painting subjects in their own environments. 1) When did comedy and art meet? I started painting my comedians series in early 2013, though it was only after a few months, when I painted Lloyd Langford, that a joke made it into a picture. Lloyd sat (horizontally) wearing the banana suit from his recent Edinburgh show, and somehow went straight into a Classical pose associated with the goddess Venus. I’d been about to start a small monochrome painting on panel, but happily had a large canvas to hand, so changed my plans. The combination of the Classical reference, the daft costume and Lloyd’s deadpan expression made me laugh out loud several times as I worked. 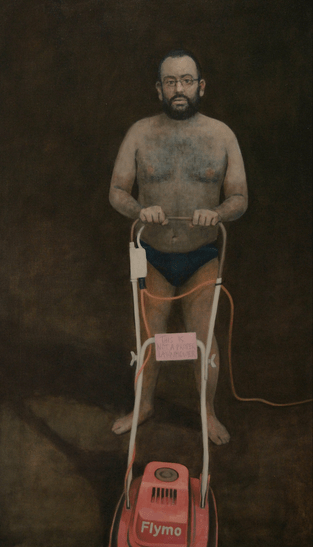 Similarly, David Trent had some suggestions (demands) for his sitting – namely that I provide him with a lawnmower and he pose wearing only Speedos. As it turned out, David wasn’t happy with the mower I’d got for him (a Flymo), but he gallantly went ahead with the session with hardly any complaints. I painted this picture in quite a dark and dramatic style, as befitting a portrait of such a serious fellow. 2) Have you found painting comedians to be any different to painting people who are not comedians? Performers in general – or at least those I’ve worked with – may be a bit more physically self-aware and comfortable being looked at than some other portrait sitters (I’ve never had a performer overcome by a fit of the giggles at the start of a sitting, for example), but that’s about it. It’s been a lovely mix – some people arriving with clear ideas about how they’d like to present themselves, and others who work it out on the day, sometimes going for quite traditional, formal poses. In a lot of cases sitters came to my studio as they were passing through Cardiff on tours. This was great, in that I was able to work with people I might not otherwise have been able to, though a few times it was quite challenging in that they could only spare a couple of hours. This brought an urgency to the work, which was always fun, though the results may have been a little hit and miss. 3) Where is the strangest place you have had to work? I recently painted a portrait on bus for the Wales Millennium Centre’s Ar Waith Ar Daith project (commemorating ten years of the WMC), though so far all but five of my comedians paintings were made in my studio in Barry. Of the others, four were made in a theatre space in Edinburgh (thanks to Sweet Venues) and one in Rhod Gilbert’s front room in London, so nothing particularly strange there – just unfamiliar light and the need to take everything I might need with me, which was harder than I expected (in the case of going to paint Rhod, I forgot to take a palette, which was a bit ridiculous). Top tip for portrait painting during the Edinburgh Festival: don’t make it the final week. People are tired. Heroic Nat Luurtsema battled exhaustion throughout her sitting, nodding off a couple of times. 4) Which comic would you most like to work with? Too many to list, though Bec Hill and Marcel Lucont both modelled for a portraiture workshop I ran at this year’s Machynlleth Comedy Festival, and were brilliant. I envied everyone else, with their easels and charcoal, and wanted to join in. Also the excellent Jordan Brookes – “He has a beautiful face”, as my mum rightly observed recently. 5) What would you like these paintings to convey? If I can convey just a little of the warmth, kindness and exquisite good looks of comedians everywhere, then it’s all been worth it.